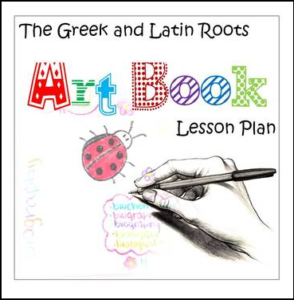 This Greek and Latin roots lesson combines the enjoyment of art and creativity with the rigor of vocabulary development. It is basically a mnemonic activity, designed to help students commit the meanings of the Greek and Latin stems to memory. I made this lesson for a summer school English class made up of students with reading levels ranging from 4th to 9th grades. Classes were two hours per day. I gave them five class periods to finish. I gave extra credit for coloring. The more time they spend on the imagery, the more they are absorbing the meaning of the root. I can’t over-state how much success I have had with this lesson. It’s ideal for visual learners but fun for everyone (and easy to grade, too!) It keeps the kids interacting with roots and stems over long periods of time. It forces them to synthesize the roots and apply their knowledge in an original way, a personal way that has meaning for them. The best part is, it is simple and doesn’t require a lot of complex input or instructions from the teacher. Just show them an example, give them the materials and the list of roots and away they go. This is a stand-alone, free product. You don’t have to buy any of my other products to make this lesson work. If you are interested in increasing the depth, breadth, and time you students spend learning Greek and Latin roots, check out some of my companion products that complement this lesson. Greek and Latin roots, suffixes, and prefixes, sometimes called word stems or word forms, are part of the Common Core Standards from third grade to tenth grade. Greek roots are word parts that have meaning. They are the building blocks of thousands of English words. Chronology, polygon, bicycle, telescope, astrophysics, hyperventilate — the list goes on an on — all these words contain one or two Greek roots. I have been teaching in middle and high school inclusion classrooms since 2005. I’m also a graphic artist, husband, and dad of two elementary school kids! If you like the products in my store, FOLLOW ME by clicking the star on my store page. My Followers are eligible to win a $25 TpT Gift Certificate every month. Take a voyage to my blog for news, reflections, teaching resources, and freebies. Visit my FACEBOOK page for giveaways and promotions. Check out my PINTEREST Boards for teaching resources from educators everywhere! Copyright © Steve and Christine Gipson. All rights reserved by author. This product is to be used by the original downloader only. Copying for more than one teacher, classroom, department, school, or school system is prohibited. This product may not be distributed or displayed digitally for public view. Failure to comply is a copyright infringement and a violation of the Digital Millennium Copyright Act (DMCA). Clipart and elements in this PDF are copyrighted and cannot be extracted and used outside of this file without permission or license. Intended for classroom and personal use ONLY.